If all the items are in stock and your order is received before 2pm we will generally dispatch goods the same day. Please note that dispatch is also subject to payment authorisation being received from the customer's credit card company and if authorisation is not received before 2pm on the day the order is placed, we cannot guarantee dispatch the same day. 'Next day' delivery means packages can be delivered up until 6pm the next working day after the goods leave our warehouse . Normal delivery times do not include weekends, so an order received on Friday will not be delivered on Saturday. For example, an order made for next day delivery before 2pm on a Friday is subject to a credit check before dispatch. If the payment is authorised successfully before 2pm, the goods will be packaged and leave our warehouse the same Friday afternoon. The courier company promise to deliver up until 6pm the next working day. The package could therefore arrive at its destination anytime up until 6pm on the following Monday. Orders placed after 2pm on Friday will be dispatched the following Monday. Please Note: We do not currently ship on weekends, under rare circumstances the delivery calendar may allow you to chose a date not covered by our shipping policy. If that occurs, we will ship your item on the next available date. Orders placed using V12 Finance can take an extended period of time to process and clear. If your agreement clears with V12 before 2pm your order will be sent out the same day. If the order clears after 2pm it will be sent the next working day. Working days are classified as Monday - Friday for the purpose of despatch. Orders placed using our finance option can ONLY be delivered to the registered card holders address. This is due to strict security measures put in place by the finance compan y. Oversized items are not covered by the free shipping offer and will be subject to a £20 charge even if the total value is over £99. This is due to the neccessary use of an alternative courier service that will handle the additional size and weight. Should you wish to specify a delivery date, this option is available at checkout. 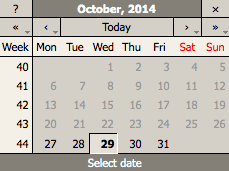 Simply choose your required date from the pop out calendar and we'll take care of the rest! Only dates that are available for delivery will be selectable. We will try our best to ensure your items arrive on your chosen date, however this may not always be possible due to factors out of our control. Specified delivery dates are only applicable on the basis that all items are in stock at the time the order is placed. If one or more items are out of stock, we will wait until the order is complete before sending the parcel. However, if you require us to send part of the order separately before the remaining item(s) comes into stock, please get in contact with us regarding the order, as additional carriage charges may apply. All efforts are made to fulfil orders within 14 working days. However additional and unavoidable delays may occur subject to product availability. In the event of a delay we will contact the customer and keep them informed. Please note: Some heavy or oversized items are subject to a £20 delivery surcharge. If you feel that your order is small enough to be sent by regular post and you have not been offered this option at the checkout please email Customer Services or telephone us on 0208 795 4001 to discuss delivery at the cheaper rate. We offer a Collect In Store service. To use this facility, check out as normal, choosing the "Ship To This Address" option, when it comes time to choose your shipping option, select Collect In Store. We will process your order and have your goods ready to collect from us. To collect your goods, you must provide a valid photo ID, such as a Passport or Driver's License and the card used to make your purchase. We cannot release your goods without proof of ID and the card used to make the purchase. If your goods are not in stock at the time you place your order, we will notify you and provide an ETA. When the goods arrive with us, we will let you know and you will be able to collect from us. Orders placed using V12 Finance CANNOT be collected in store. These items MUST be delivered to the address of the cardholder as per V12's Terms & Conditions. Collect In Store orders placed after 2:30pm on Friday or at any time on Saturday will not be available for collection until the following Monday.